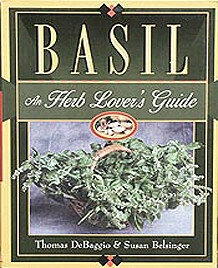 Category: Special Order - Out of Print. 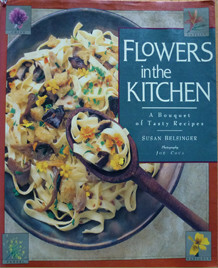 Please contact Susan Belsinger directly to find out how to obtain this book. 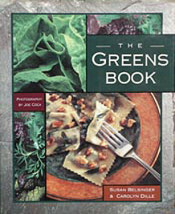 The Greens Book will make you want to eat your greens from the gorgeous photos by Joe Coca to the delicious recipes featuring every type of greens you can imagine. Description and cultivation of salad greens and herbs, lettuces, spinach, cress, chicories, escarole, cabbage, collards, mustard and turnip greens, kale, beet greens, chard, and many others are discussed. Most of these are easy to grow, packed full of vitamins and minerals, and wonderful in recipes such as salad of baby lettuces & herbs, stir-fry of jade & ruby greens, chard baked with parmesan, cabbage, potato & caraway soup, fettuccine with rocket, cress, & goat cheese, and pink lemonade & sorrel sorbet. Goodness gracious great gobs of greens!